It is the dream of many a chub angler to stumble upon a tranquil and secluded river that rarely sees a fisherman grace its wild and over-grown banks from one day to the next. Probability suggests that the average angler is put off by the prospect of walking long distances through thick under growth, armed to the teeth with all manner of tackle and bait, looking for a swim that is big enough to fish from comfortably. Add to this the low density of fish stocks and the inevitable lack of bites, the average angler leaves despondent and does not return again, opting instead for an easy access carp puddle. In late February 2001 my dream was realised when I found such a river. Little did I know just how much it would enhance my skills in watercraft and help me in the study of chub in such a challenging and thought provoking environment. This inevitably led to the start of my career in bait development. Like many anglers I spent a lot of time studying ordnance survey maps looking for likely looking waters to explore. At the time I was living in Powys in Mid Wales and more often than not my recces proved fruitless as the waters were often the unfortunate victims of chemical leaching from nearby farms, leaving the rivers devoid of fish. However, this all changed when by chance I spied a glimmer through the trees when I was driving home from another fruitless search. Pulling over to the side of the country road, I walked across the field and upon reaching the trees I was greeted with the sight of a wild and winding river that was carrying a lot of floodwater. It was late February and bitterly cold, but I was mesmerised by this river. It was chocolate brown and carrying at least 6 feet of extra water, but the meandering bends and bank side cover just screamed chub to me. I left for home and made a mental note to re-visit this water in the spring. 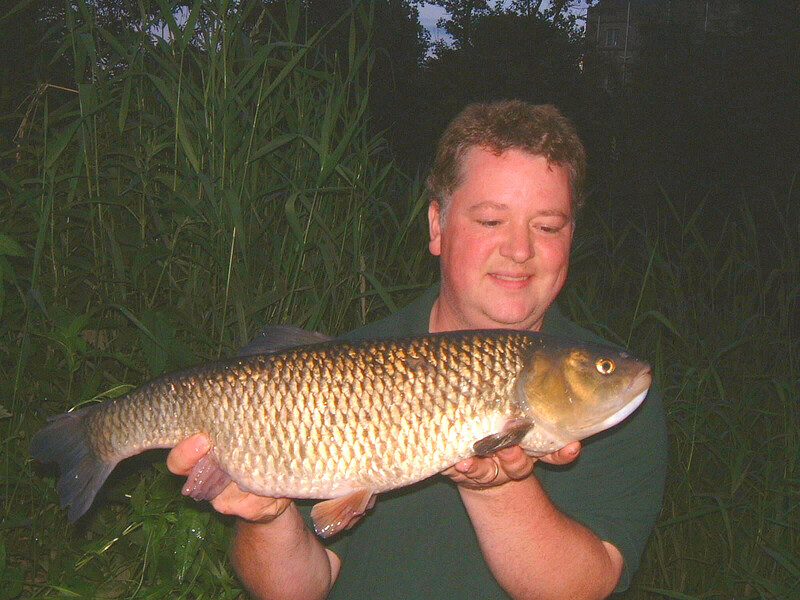 Early April 2002, and I was sitting at the bar in my local pub with my good friend and fishing companion Steve Clarke. We were tapping the landlord for information about venues that held decent chub and barbel in the area. The landlord mentioned that he used to fish the Severn near Welshpool years ago and told us that he often caught huge chub accidentally whilst fishing for grayling on the fly. Steve asked Barry what size chub they were to which Barry replied ‘Ooh they were this big’. Steve and I started to laugh and take the mick as you do, when Barry disappeared behind the bar then re-appeared five minutes later clutching a photo album. Barry pulled out three photos and put them in front of Steve saying ‘here you are lads, what do you think’? Steve coughed in his pint and started to choke as the froth went up his nose. Well that was it. I was on the floor crying with laughter at Steve’s antics which made Steve splutter even more, spraying beer over the bar and over the photos. I picked up the photos still laughing at Steve and gave them a wipe to get the beer off. At first I could not focus as the tears were welling up with laughter, but I soon stopped when my eyes readjusted. There in front of me was a picture of a very big chub. Barry said that he did not have any scales with him so did not know what size it was, but they were all the same sort of size, pointing out the other two photos. They were indeed three different chub, not brilliant quality photos as he took them himself on a self-timer on a bank stick. However, this did not detract from the sheer size of the chub he was holding and the massive heads on them. Steve had now recovered some self respect and ordered more beers, and we both just stared at the photos laid before us in awe. Now Steve and I had never caught a ‘five’ before, but these were clearly a lot bigger than that and we guessed they were between six and seven pounds. The background in the second photo I looked at reminded me of that stretch I stumbled upon the previous year and I quizzed Barry as to where exactly this was. Barry confirmed that it was indeed the stretch I had gazed upon when it was in flood, but in the photo the water was low and in summer conditions and very attractive. Steve and I planned to take a look for ourselves the following week to suss it out. After walking the river for an hour or so, Steve stopped in his tracks and beckoned to me to have a look. There under the roots of an over-hanging tree was our first sighting of a chub with its big white lips opening and closing as the current washed past its gills. It was about four pounds or so and was quite content just hovering in the gentle flow. From the left, another two chub glided in to join the other one and we both just looked at each other then stared back at the fish. They were much bigger than the first; at least five pounds with enormous heads that made them look prehistoric. With a bounce in our step we walked a bit further down stream and spied a pair of white lips mid river, then another pair of lips. One of the chub made a beeline toward our bank and briefly disappeared under the bush, but then ghosted out from the shadows to reveal its enormous frame. We had never seen a chub this big in the flesh so to speak, and we guessed it was at least a ‘six’. To coin a phrase ‘we were hooked’, and so started a plan of attack to get the fish feeding on our bait during the closed season. Over the next two weeks we baited up these swims with hemp, luncheon meat and corn and actually saw a few of the chub feeding on the corn and luncheon meat, but we also noticed that they would only pick up a few pieces then swim off. We needed to give the chub something that would attract their attention and keep them feeding. It was Steve who had introduced me to the joy of fishing rivers for chub and barbel the previous year, and I shall be eternally grateful for the skills and his knowledge of water craft that he shared with me. 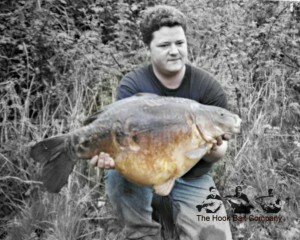 I had been a carp angler for 15 years, fishing waters such as Horton Church Pool, Savay Lake and Pit 4. However, since I moved from London to Mid Wales I was disappointed with the lack of big carp available for me to fish for. This is when Steve introduced me to the magic of fishing rivers and opened my eyes to another side of fishing. During my carp fishing years I was heavily into making boilies for myself and friends, and thought that maybe I could make a boilie that would be accepted by the chub. To my mind the boilie would need to be savoury with a high leak off value that would leach out attractants down stream to entice them out of their safety zones. I knew exactly what I wanted in the recipe and so set about making three variations of boilie using my own variation savoury base mix but 3 different flavours. The boilies were cooked for fifty seconds then freshly frozen to seal in the flavour, oils and attractants. The result was a very pleasing soft textured boilie that would constantly leach out attractants at different stages due to the different types used in the make up of the bait. Tank tests were fine but I needed to try it out on the river so, armed with 3kg of bait I made my way to the Severn to scatter my offerings and hopefully see the chub’s reaction. My plan was to liberally bait the swims I had previously seen fish in, and return to each one to check out the situation. Due to the relatively warm spring we were experiencing the river was running very clear making observation much easier for my test. My tree top observations eventually revealed that indeed the chub were interested in the boilies and that the scent of the bait wafting down stream did entice them to venture up and investigate the trail. I was absolutely buzzing with excitement at the prospect of angling for these chub that were in truth boilie ‘virgins’, yet they were more than eager to try them without fear or trepidation. I just had to fish this place, so I popped down to the local tackle shop and paid the subs for both Steve and myself to fish. Initial findings were very interesting to say the least and I was particularly glad that my knowledge of bait and bait applications from my carp fishing years were now proving to be acceptable to the chub. I had to try the bait out again many more times to prove it was not a fluke, and over the next three weeks Steve and I were very pleased to witness several chub and even a solitary barbel become more and more willing to feed on the new bait. One flavour in particular was proving to be more popular to the chub so the decision was made for us and I duly made up batches of 10mm & 14mm boilies with matching paste for the upcoming start of the new season. The glorious 16th finally arrived and I was out of the van and literally jogging across the field to get to the river and get fishing. I deposited my rod, net and rucksack back from the waters edge and baited four likely looking swims before shinning up an alder to survey the scene. I suppose 15 minutes had passed when I happened to glance down directly beneath me and was shocked to see that two large chub were just there, swaying slightly in the flow. I was gob-smacked that I had completely missed seeing their approach when another smaller chub appeared from under the bank and joined the other two. Brilliant, I had discovered a secret hideaway. I pulled a couple of boilies from my pocket and flicked them through the branches upstream of the chub and watched as they immediately moved towards the plop of the baits hitting the water. It did not take very long at all for all three chub to locate the boilies and eat them, and with a further handful of baits flicked further out I moved down from the tree as they searched for more bait. I had decided to fish with a roving boilie, free-running on a hook length anchored by a 2oz grippa lead. I moved slightly upstream from the group of chub and dropped my rig in the water a rod length out and held it there. The 2oz grippa was there solely to anchor the line beneath my rod top so that I could tempt the chub to feed on the same line I was fishing. I flicked out a few more boilies and as I had hoped, the chub followed the baits and were becoming more aggressive in there feeding as the bigger chub forced the smaller fish away. I started to pay out line so that my boilie bait traveled towards the feeding chub on a relatively straight line until there was about a 4 foot hook length. The boilie was wafting enticingly up and down, side to side with my forefinger holding the line against the spool and I introduced 2 more boilies on my feeding line. One of the big chub moved closer to my hook bait and I let a little more line pay out through the swivel of the lead, causing the bait to wobble mid stream and hopefully attract the chub. Indeed those big white lips engulfed the boilie and as I felt the line tense under my finger, I leant into it setting the hook. Pandemonium quickly ensued as a very angry chub made every effort to find sanctuary in the root system of the overhanging trees. However, the action of the Arbitrator rod made sure that it would not see sanctuary until I had taken a much closer look at my prize. Peeling back the folds of my landing net I was in awe of the sheer depth of its bronze flanked body and absolutely massive head, it was huge! On the scales she went 5lb 2oz a new personal best for me and my first ‘five’ from the river. The chub was clearly destined for bigger weights in the winter months as the body was very long and hollow towards the tail end. I was made up with my capture of such a magnificent creature and quickly took a snap shot before releasing her a little further down stream. Happy with my lot, I packed up and headed off to work very happy. The next week saw me visit the river every other day after work for a few hours stalking, using the same tactics as before with some rich pickings. I tempted 24 chub over the magical 5lb mark with 3 of them over 6 to a personal best of 6lb 7oz. I was on cloud nine with the results I was having and was soon joined by Steve for his very first session on the river, due to the fact he lived in Cheshire and was concentrating on his barbel fishing on the river Dove. I was shocked when Steve said that he was not going to use the bait I had developed but instead, would fish with The Source boilies which had helped him catch a few barbel off the Dove the previous week. Steve also stated that we needed to test the new bait against other baits so he would use what he was used to. To cut a long story short, throughout June and July Steve fished solely with The Source and did indeed catch 6 chub over 5lb to 5lb 11oz , with a further 11 chub between 2-4 lb. During the same period I had caught 47 chub over 5lb, with 6 chub over 6lb all on the new bait wrapped in matching paste. Enough said… that’s what I call Proper Chub Thumping! Company was formed and with Barbel to 17lb 7oz and chub to 7lb 4oz having been reported by satisfied customers, the ‘River Secret’ range grew to include boilies, dumbells, paste and a liquid bait dip. Over the next few years I developed 3-B and Natural Crave which have really scored well among the lads using them. I still make the journey down to Wales whenever it is possible to do so, and enjoy every precious minute spent in search of those wonderful chub. The sizes of chub caught are quite exceptional for the region and to catch them on the wild upper reaches of the River Severn in Wales is the pinnacle of my angling achievement so far. The chub are nomadic and hard to find, but the bait often made it easy to catch those elusive fish. Many anglers have struggled to catch here and indeed, have given up the ghost and gone elsewhere to catch fish. Angling ability coupled with good water craft are needed to catch consistently, but having the right bait which is both attractive and nutritional is of the utmost importance to me. For the traditionalists out there I have every respect for all styles of fishing and indeed I have also caught on baits such as lamprey, worms, spam and black slugs, and will continue to do so whenever the situation calls for it. I choose to fish with a modern approach because of my years of carp fishing using nutritional baits and I am very confident in my approach. The bait I have designed is very nutritional and attractive to chub, barbel and indeed carp and I incorporate the latest innovations in tackle and accessories to present my bait to the fish, to the best of my ability. I like my rig to be invisible but my style of fishing for chub and barbell may not always seem orthodox to the purists out there, but it works very well for me so why change?